Syed Rizwan Farook and Tashfeen Malik, who were behind the San Bernardino attack that killed 14 people last week, had target practice days before, the FBI has said. Tashfeen Malik and husband Syed Farook visited ranges in the Los Angeles area, said David Bowdich, assistant director of the FBI’s Los Angeles office. David Bowdich said both were radicalized and had been “for some time”. The US is investigating last week’s attack, which happened at a health care centre, as an act of terrorism. However, David Bowdich said there is no evidence yet that last week’s tragedy, the most deadly terror attack in the US since 9/11, was plotted from overseas. The FBI did not have an investigation open on restaurant inspector Syed Farook before he and his wife opened fire on his colleagues at a work event at the Inland Regional Center. They were both killed hours later in a shoot-out with police. Investigators said they found 19 pipes that could have been turned into bombs at the couple’s apartment, rather than the 12 previously reported. A photo obtained by ABC News shows the couple arriving at Chicago’s O’Hare International Airport from Saudi Arabia in July 2014. 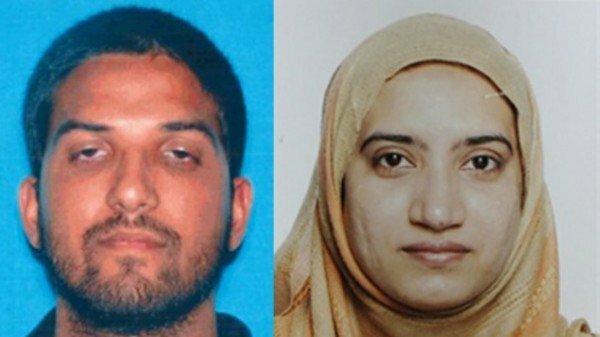 According to US officials, Syed Farook traveled to Saudi Arabia and returned about two weeks later with Tashfeen Malik, who was able to come to the country on a fiancé visa. Syed Farook’s father told Italian newspaper La Stampa his son sympathized with ISIS and was fixated with Israel. The family’s lawyer said he had recently told them co-workers had mocked his beard, and that the family knew he had two handguns and two rifles. But they did not know about the arsenal of weapons the couple had amassed. Tashfeen Malik reportedly praised ISIS on Facebook on the day of the attacks. The Department of Justice said on December 7 it is monitoring any anti-Muslim sentiments or attacks that may emerge in the wake of the mass shooting.